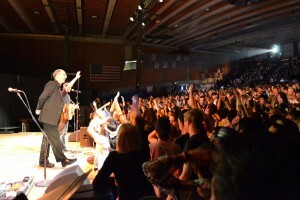 Youth Convention celebrates the energy, excitement, commitment and vitality of our Church. Created for, by and with youth, this event brings together young Catholics from all over the Seattle Archdiocese in addition to delegations from Eastern Washington, Oregon and Canada. Open to all high school students attending with a parish or school group. The Catholic Youth Convention (CYC) is a weekend experience being held on November 11-12 at the Washington State Fairgrounds in Puyallup of evangelization and transformation, where all parishes are welcomed to, and supported in, providing their high school youth with an encounter with God and deepening of our Catholic faith. CYC provides a place for over 1400+ youth to enter into a deeper, more vibrant relationship with Jesus Christ and return to their parish communities with ardor for the Gospel. Visit the Office of Youth and Young Adult Evangelization website for more information.